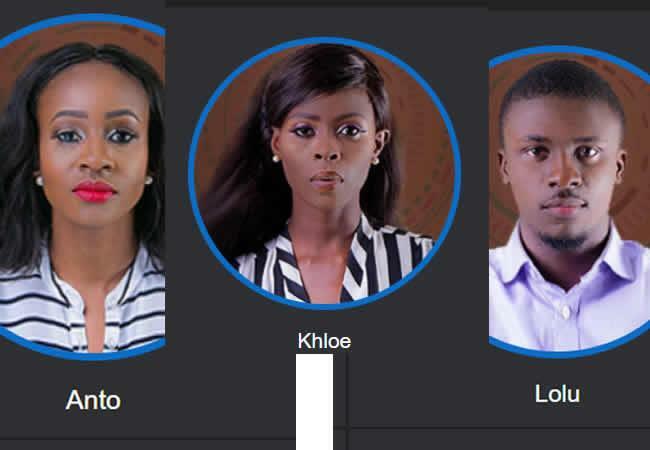 Lolu, Khloe and Anto on Sunday made their exit from the Big Brother Naija Reality TV Show. This occurred immediately after the housemates lost their wager with Miracle to blame for the loss. It is the 77th day of the show, and the semi final week. As expected, the five housemates up for eviction had their hearts pounding. But at the end of it all, Anto, Khloe and Lolu were evicted. Khloe and Anto have obviously outlived their days of grace as they were finally evicted from the House. They were both brought back in the first of its kind after they were first ejected. But the bubble has finally burst for them and they’re out for good. For Khloe, tonight marked her first Eviction. Khloe one of the two Housemates to have been Disqualified earlier in the season and Anto had returned into the House determined to give the best of themselves. While Khloe’s sensible and caring side came out more, Anto’s leadership and vulnerability will remain in the BBNaija chronicles. For some reason, Lolu had also anticipated his own Eviction having confessed an unusual nervousness. The self-effaced geeky Housemate had entered the House with his simple and unpretentious manners that could nonetheless not be discarded by any of the other more flamboyant characters. If anything, thanks to his irresistible brains, Lolu has offered a sweet revenge to all those whose need for love has gone unfulfilled by winning the minds and hearts of his peers. Before the final eviction, Biggie called the House into the Arena, where ten suitcases were lined up, awaiting for the eight remaining Housemates to open them. The aim was for Housemates to secure another Wager victory, in light of a slight twist: each suitcase contained a small gifts, but only one held a cash reward. Biggie instructed Housemates that whoever opened the suitcase containing the money reward would have a claim on the reward, yet also automatically imply that the entire House lost the Wager.